Fred and Denise White need the perfect yard to entertain and raise the son they are adopting. Carter and team install a brick patio, a relaxing pergola with day beds, grill area and bamboo walls, creating an oasis in the desert. 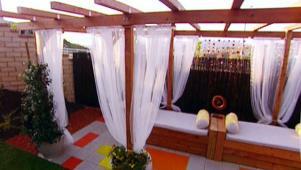 Carter creates a calm and relaxing patio area for a family.